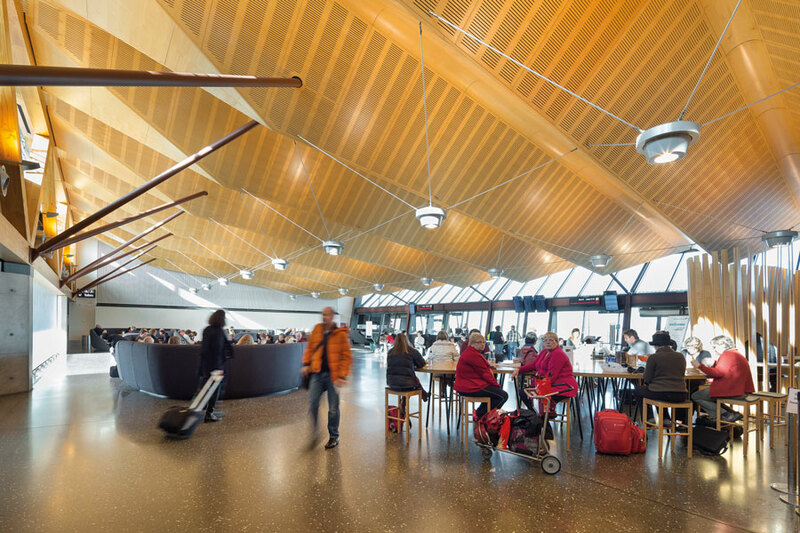 The Christchurch Airport Regional Terminal building has been designed to create a completely separate identity form the recently expanded Christchurch Domestic and International terminals. The joint client for the design was Air New Zealand. 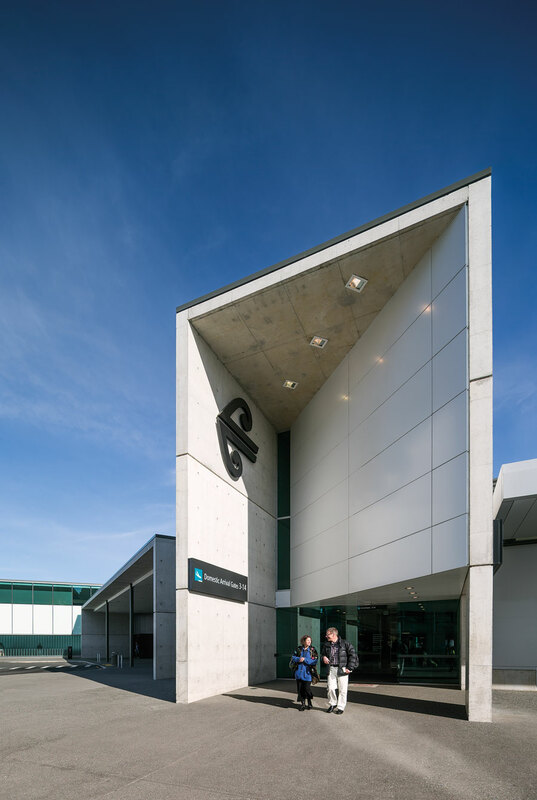 The current major user of the terminal is Air New Zealand and the terminal actually merges with the main terminal building which is a multi-user facility. 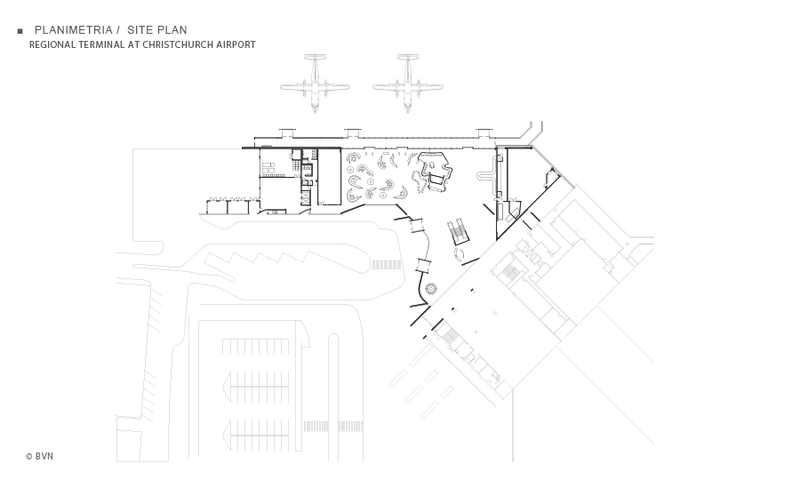 The functional brief was to provide the terminal hub for regional air travel throughout the South Island. 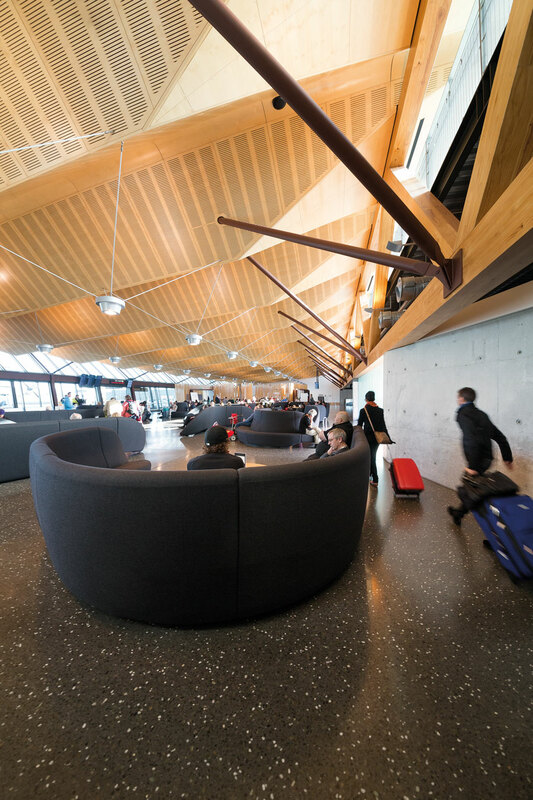 The aspirational brief was to design a space that creates a memorable and emblematic New Zealand space as this terminal is the staging point for many international visitors to the major destinations of the South Island. 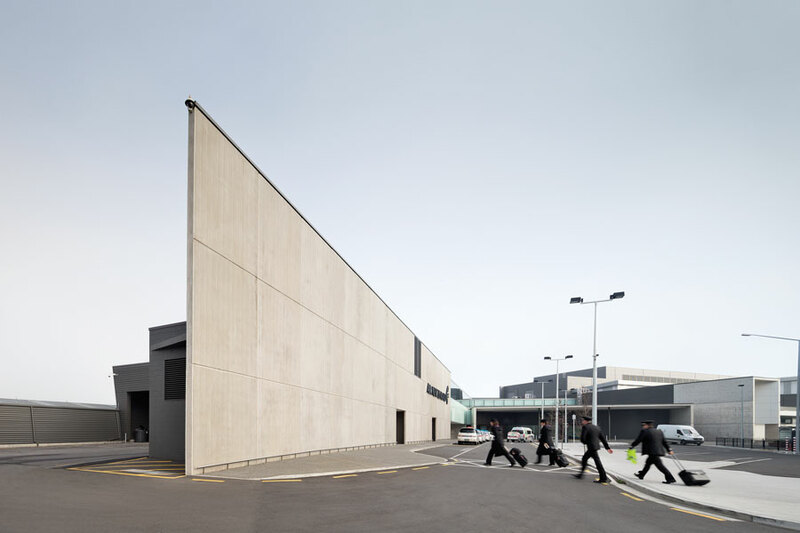 The external form of the building is deliberately understated on the landslide to ensure the memorability of the interior contrasted with the exterior. 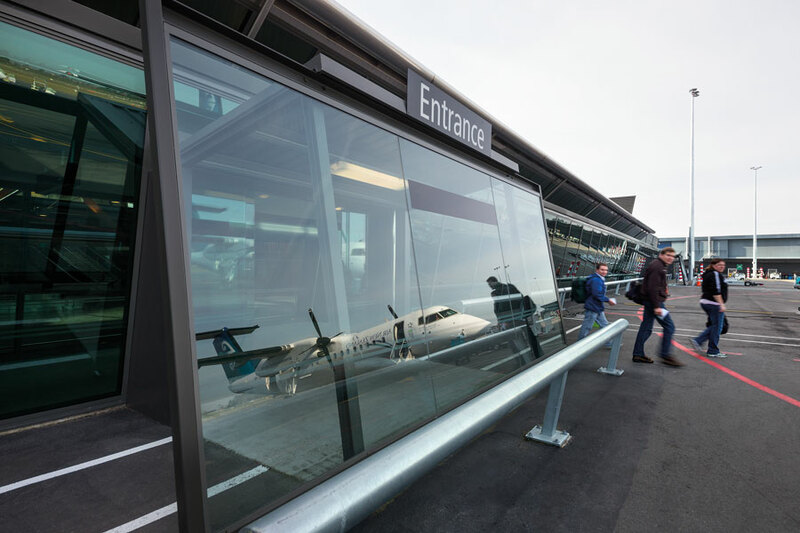 Airside is designed as a refined abstracted wing which sits quietly but in affinity with the prop jet aesthetic of the regional aircraft fleet. 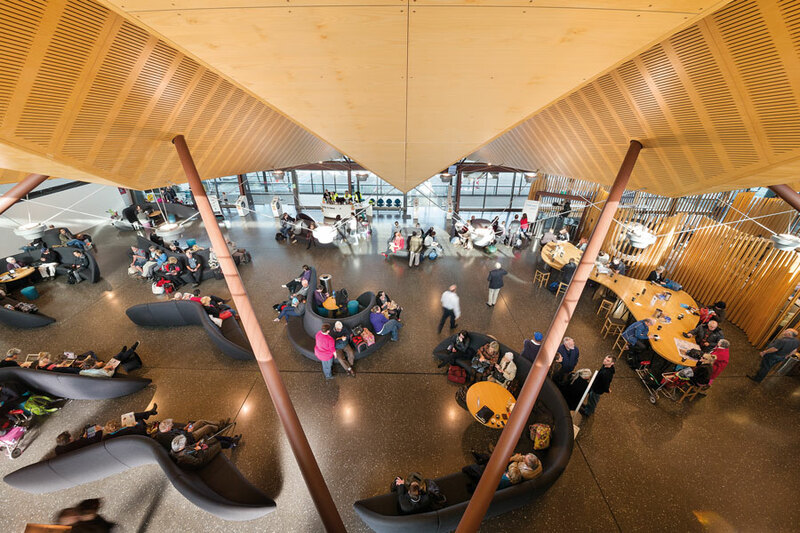 The question of what is emblematic of New Zealand is difficult and ultimately subjective. The narrative chosen is to abstract natural forms related to the South Island. 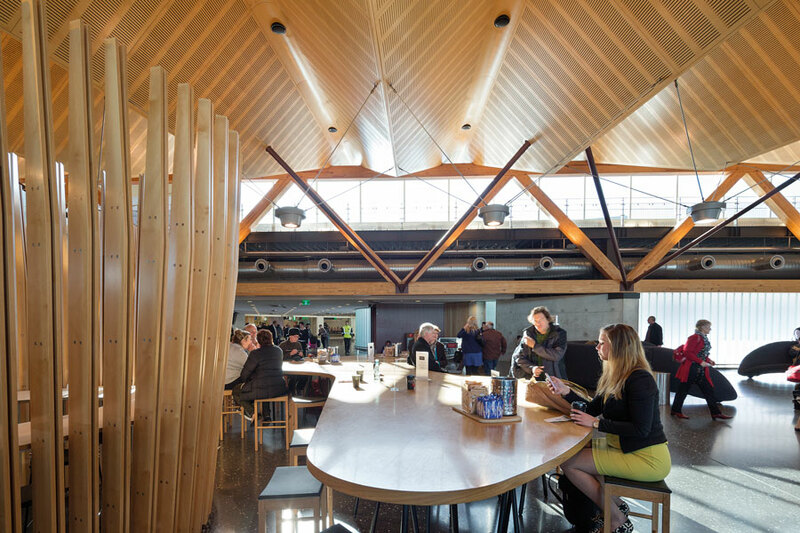 Hence the folded form of the ceiling finds the origins of its expression in the Southern Alps which are the backdrop for the airport; the large timber truss finds its expressive origins in the old timber trussed bridges found throughout the South Island; and the organic forms of the cafe and the bespoke seating are found along the coastline as the forest meets the ocean with kelp swaying at the ocean edge. 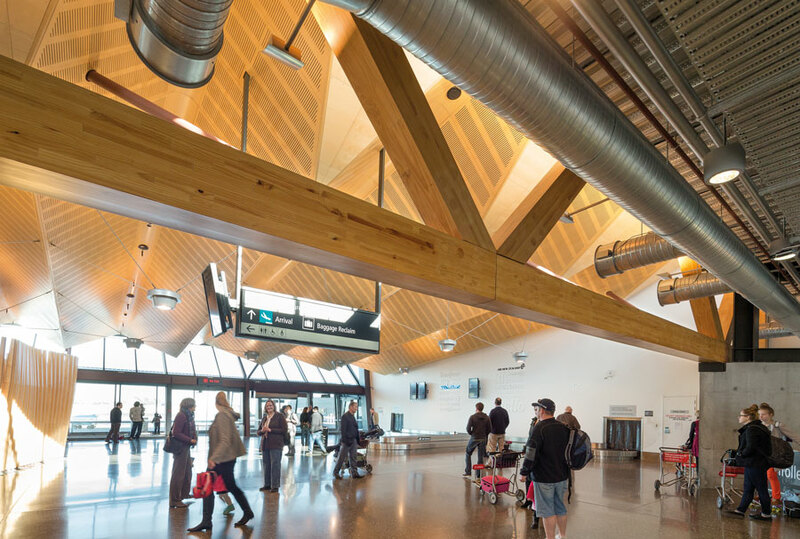 The truss functionally provides a dedicated access pathway for goods that need to be taken from the ground level loading dock at the end of the building to the upper level of the domestic terminal retail area. 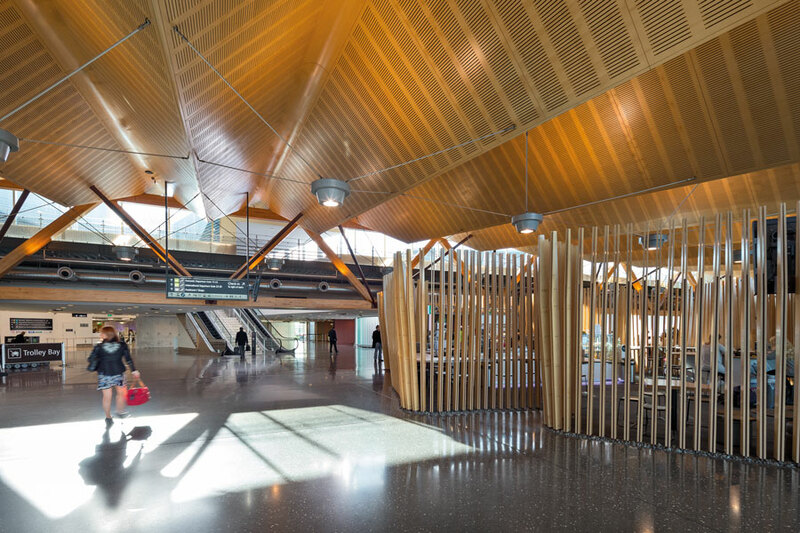 The truss also provides high level north glazing to ensure direct sun - especially in winter- can penetrate deeply inside the regional terminal. 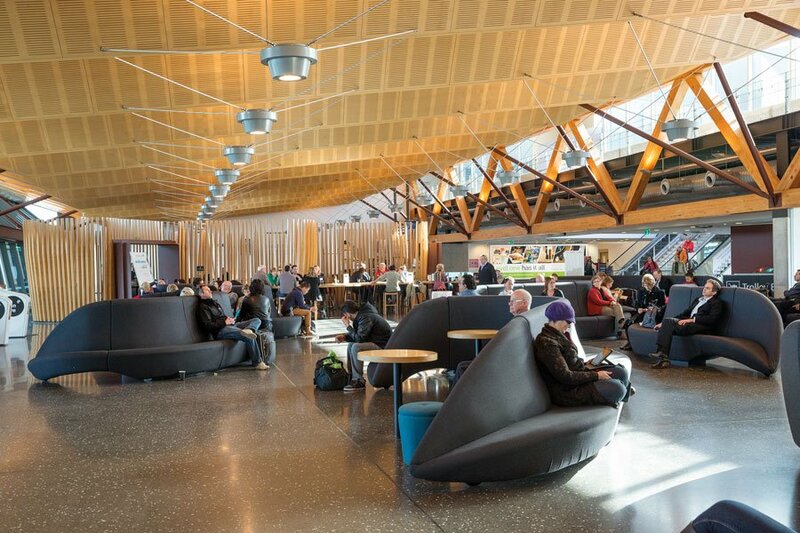 The arrival and departure passenger flows are separated by a cafe and an Air New Zealand "Koru-express". Escalators link transit passengers to and from the regional and international terminals. 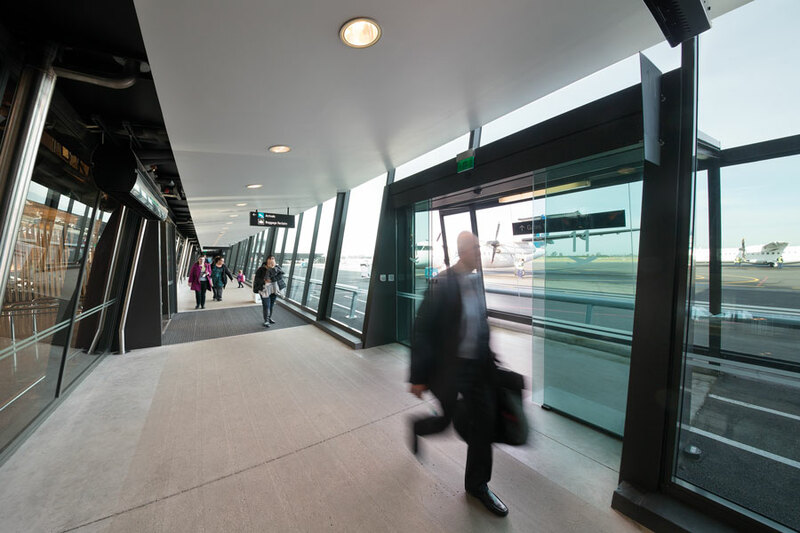 Pedestrian entry to the terminal is signified by the concrete arch which visually delineates the domestic and regional terminals and by the steel shroud doors located within the large concrete portal. 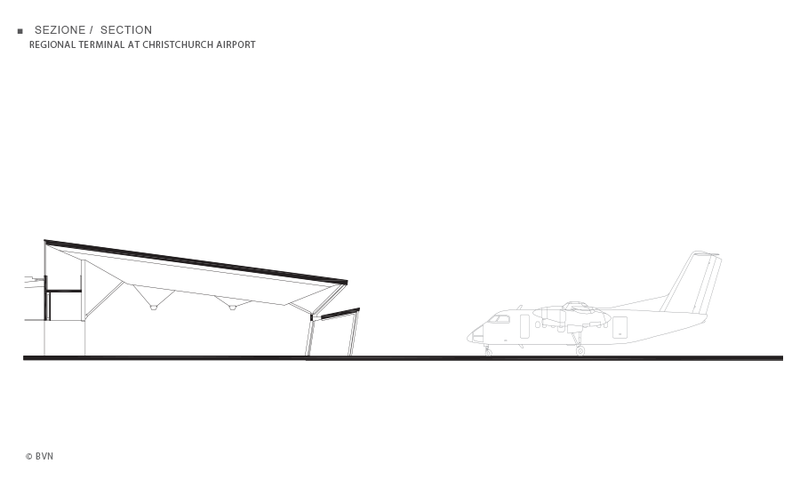 Together with the concrete wall enclosing the service dock, these elements make a discrete expression of the regional terminal quite different from the remainder of the airport, whilst being related in form and materiality to it.